WOW! 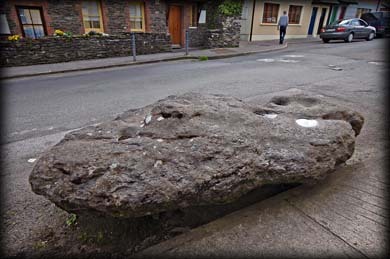 This boulder is a monster, measuring 3.48 metres in length and up to 0.87 metres in width. It has been suggested that it might be a glacial erratic deposited here by retreating glaciers. Another theory links it to the standing stones and rock art at nearby Milltown. There are a total of seven bullauns on the upper surface which were probably used for grinding grain. The lane next to the bullaun is Chapel Lane. During the penal times people would leave sand in the depressions to let the priest know it was safe to say mass on the nearby strand. Situated: Very easy. 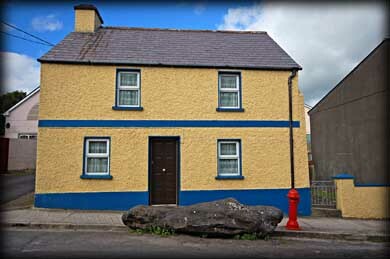 Located on Goat Street in the centre of Dingle Town. Discovery Map 70: Q 4450 0145. Last visit July 2011.